Neptune’s Lair is found at the end of Long Beach Walk, left of where the shore intersects the bluff. Routes are numbered left to right facing the bluff. The first two routes are considerably left (under huge leaning boulders) of the main 5 which are easily seen on the cliff face. *Will be rebolted in 03-02. 1.) Medusa, 11 c/d, bolt count 2/4. Leftmost route, shares bolts and anchors with #2. 2.) 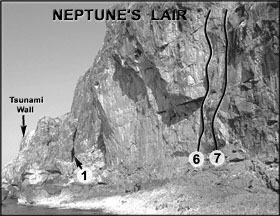 Neptune’s Lair, 11 c/d, bolt count 2/4. 3.) Conch-U-Brine, 11 c/d, bolt count 2/8. 4.) The Tempest, 11 c/d, bolt count 2/7. 5.) Poseidon, 11c, bolt count 2/9. 6.) Booby Eggs for Breakfast, 10d, bolt count 2/5. Misconceived trad route. Not recommended. 7.) Calypso, 11b, bolt count 2/7. Rightmost route.